Brief Synopsis – A publicist must raise his young daughter alone and figure out how to move on with his life after his wife dies in childbirth. My Take on it – I have always been a fan of Kevin Smith. Ever since a friend hooked me on Clerks (1994), I have seen just about all of his movie. His dialogue was always amazing and his characters actually spoke like real people would to one another. Most of his movies have the characters of Jay and Silent Bob and it was a well known fact that most of his movies all took place in the same universe as one another which would allow Smith to borrow and lend characters from one movie to another. This movie was a small step away from and above all that and it was a step in the right direction. 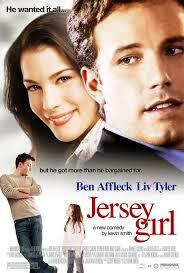 Ben Affleck is really good as the torn up inside widower who must get on with his life with a new infant in tow. Smith apparently wrote this script after his own daughter was born which made him want to create a story about loving a child as much as yourself if not more so. George Carlin, Stephen Root, Mike Starr, Jennifer Lopez and Liv Tyler are all cast very well in this movie, but the screen stealer is Raquel Castro as Affleck’s daughter Gertrude. Bottom Line – Very well done movie. Kevin Smith did this one superbly, perhaps his best movie. Recommended!